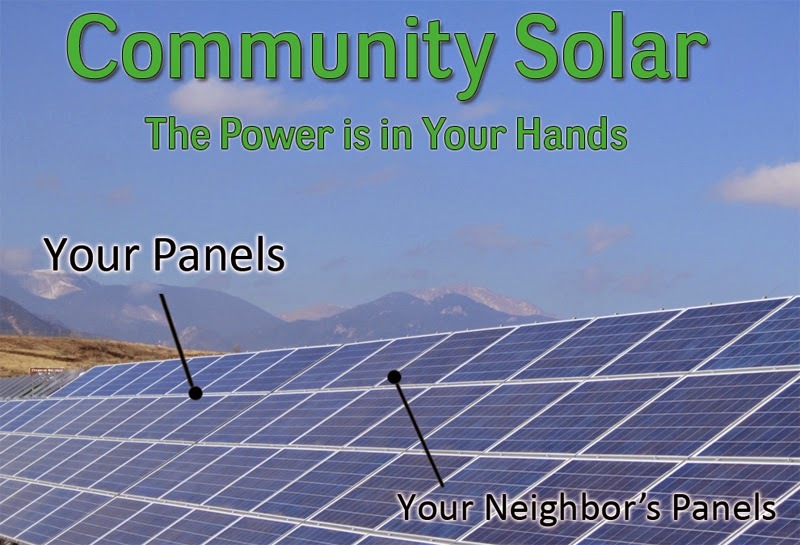 Community Solar is a solar electric array with multiple subscribers connected to the utility grid. The subscribers may purchase a portion of the power produced by the array and receive a credit on their electric bill. Utility customers within the community solar area, including residences, businesses, local governments, non-profits, and faith-based organizations, can all subscribe to the sun. Colorado Community Solar Gardens Act - House Bill 10-1342 passed in 2010 - Allows people to own an interest in solar panels that are not on their property. Becoming part of a community solar garden brings clean, sustainable power to renters of homes, apartments or offices, condo owners, people with locations that are not ideal for solar panels or live in areas with homeowner associations that limit the number or location of panels. The act also aids utility companies in achieving their state-mandated 30 percent renewable energy standard as customers sell excess power back into the grid. SB-843 - Community-Based Renewable Energy Self-Generation Program - A California bill that nearly passed in 2012 that would have establish a new business model that would have allowed developers of renewable projects to sell electricity to customers of Investor Owned Utilities (IOUs). SUN Act - Solar Uniting Neighborhoods Act - Sponosored by U.S. Rep. Mark Udall, D-El Dorado Springs, which will give federal tax rebates to solar panels hosted in solar gardens. the customers by allowing them access to benefits, from rebates to tax incentives, that homeowners get. Enables people who rent a home or apartment to take advantage of solar. Tree Preservation - By hosting panels on another rooftop or a community solar garden, people can protect the trees that shade their houses. Share the Land with ecological restoration and agricultural stewardship, using easements. Plant trees and hedges for visual screening that also take carbon out of the air. Shade Over Pavement - Instead of competing with photosynthesis. It’s better to place the solar panels on shade structures above paved areas such as parking lots and driveways. New cars can plug in here. Combine with features like roads, power lines, and snow fences. Collaboration to identify sites: Many customers want to be able to see and show the solar PV projects they buy power from. However, current community solar efforts usually focus on developing projects on sites that will be interconnected quickly and have low lease terms. Projects don’t have to be located at one site though, and could be more valuable if they’re located near customers and installed at certain locations. Utilities and solar companies could work together to identify a portfolio of sites, including remote fields, parks and parking lots, and nearby customer rooftops, and then provide customers with options and allow them to choose to buy from the sites they find most desirable. Clear and transparent procurement processes: Today, solar projects are typically procured through a one-time request for proposals (RFP). However, solar companies could decrease their costs if they have higher volume certainty over time. They could do this by revising the RFP process, seeking a multi-year contract (three to five years) for distributed PV installations. As part of this deal, the solar company would need to meet certain performance benchmarks over time. Joint marketing: Surveys show that many customers are still unaware of the opportunities in investing in solar PV. In fact, many of these shared solar programs have enrolled subscribers through word-of-mouth alone. The utility can help increase subscribers quickly, using its access to customers to increase awareness through bill inserts and online engagement on the utility webpage. Also, the utilities and solar companies can co-brand and co-message the program, emphasizing the simplicity and convenience — customers won’t need house visits and crews to install equipment on the customers’ premises, will not be involved with any on-site operations and maintenance, and could change locations without the hassle of relocating any physical equipment. Shared solar also could create an opportunity to market other utility programs. For instance, a customer interested in community solar also could be someone interested in efficiency or electric vehicles, and it makes sense to either offer bundles of measures together or target customers for new technology offerings as they become available. Community engagement: Due to the nature of shared projects located near customers, there’s a reason these programs have been called “community solar.” Yet few programs have fully embraced a community-oriented approach to encourage high levels of customer participation. In addition to traditional utility access channels, the program can meet customers where they are, engaging possible participants at community centers, including places of worship, to generate enthusiasm. * Rates are advertised to be at least slightly better than this. If enough people sign up, project rates could be significantly better than this. ** This does not include the standard savings from going solar itself, which can amount to tens of thousands of dollars more on top of the savings from this bulk discount. Zero-Down Option with Bulk Discount RateIn addition to getting solar for zero-down, as is standard in the industry, participants will also receive the discounted rate offered by the winning bidder, which will very likely be a better deal than any other rate available to people going solar individually. Duke Energy’s Green Source Rider program in North Carolina enables nonresidential customers to displace new load with renewable energy. Duke handles customer applications and then arranges power purchase agreements with renewable energy suppliers. Participants buy the generation at the power purchase agreement rate and receive a credit based on avoided energy and capacity rates. East Bay Community Solar Project - On-going community based bulk purchase of solar in the East Bay of the San Francisco Bay Area. The project is independent of any solar company. East Bay Community Solar Project has administered a competitive bidding process, after recruiting an independent, unpaid, volunteer contractor selection committee. This committee, made up of community members interested in going solar themselves, selected the contractor. This is meant to ensure that the project is transparent and executed with community sovereignty, while also providing the larger group of participants the option of responsibly delegating the legwork of bid review to the committee. SPH - Solar Panel Hosting Inc- Westminister, CO - Company based in Westminster, CO, that facilitates solar gardens. As a hosting service provider, SPH facilitates subscribers and hosts. Hosting services might include assistance with community organizing, training, financial modeling, working with vendors, subscriber management, and facilities and operations management. Vote Solar - San Francisco - Fiscally-sponsored project of the Tides Center, 501(c)(3) through the Tides Center and 501(c)(4) through The Advocacy Fund. A non-profit grassroots organization working to fight climate change and foster economic opportunity by bringing solar energy into the mainstream. Since 2002, Vote Solar has engaged in state, local and federal advocacy campaigns to remove regulatory barriers and implement key policies needed to bring solar to scale. Major Community Solar Bill Falls Short In California: What Went Wrong? Great post. This is very useful. I learned some new information. Thanks for sharing. Thanks so much for sharing the solar electric array. I am looking forward to learning more about it.